The ECBL hosted there 1st every preseason showcase this past weekend in Hickory NC which featured 7 ECBL members, 1 Free Agent Team, 2 Independent Minor League Team, NABL member Dubois Dream, and former UBA members the Winston Truth. Game 1 - Game one featured the defending ECBL Northern Conference Champions the Hickory Hoyas who took on local Independent the Gastonia Snipers in the first game of the day. The Gastonia Snipers where able to score 5 points in that last 30 seconds of the game to sneak past the the host Hoyas 89-85. The Snipers where led by Joseph Pope (6'5''-F/G-88, college: Mercy) who finished with 37pts and 8rbs and Jay Alexander (6'7''-F, college: Francis Marion) who added all 18 of his points in the second half. The Hickory Hoyas top performer was Zeke Mays who finished with 20pts and 9 rebounds. Game 2 - Independent Carolina Showtime out of Orangeburg SC took on the PrimeTime Players Free Agents Showcase team with most players from the Charlotte and surrounding areas who are looking to get signed to ECBL teams throughout the league. This game was never close as the PrimeTime Players Showcase ran out to a 47 -26 halftime lead and never looked back in the second half as they cruised to a 106-59 win. The showcase team was led by Khadier Fulcher who led all scorers with 25pts, and Scott Nadias and JoJo Sheperd who both added 15. Marquis Bracey was the lone bright spot for Carolina Showtime as he was the only player to score in double figures with 24pts. Game 3 - The third game of the day featured TBT veteran teams the PrimeTime Players and the NABL's Powerhouse Dubois Dream in a match up between two of the favorites in their own perspective leagues. The PrimeTime Players where able to hold on down the stretch by being able to make FT's and pulled out a 102-94 hard fought win. PrimeTime Players were led in scoring by Diondre Pratt (6'4''-G-94, college: Johnson C. Smith) with 27pts and the DuBois Dream where paced by Hasiim Dixon 19 and Sam Rozelli with 18. Game 4 - The Gastonia Snipers returned for their second game against the Augusta Eagles where they started off hot and never looked back in cruising to a 100-76 victory as they went 2-0 in a very impressive showcase showing. Joseph Pope again led all scorers with 27pts and 14 rebounds fro the Snipers and ECBL 1st Team All League performer Mike Couvson finished with 34pts for the Eagles. Game 5 - The new look NC Coyotes came in with a handful of new faces for 2019 and went toe to toe for 38 minutes with the DuBois Dream in what may have been the best game the day. During the game both teams had the lead on multiple occasions with nobody ever holding a double digit lead. The game came down to the very last minute with Albert Varracallo for Dubois Dream knocked down a three pointer at the 35 second mark of the second half to tie the score at 88. After a stop by Dubois, they had the final possession with 12 seconds left in the game but threw the ball away to Raymond McKeithan (6'7''-C, college: Glenville St.) who looked up court and found Makia Faulkner, who knocked down the game winning 3 pointer with 1 second remaining in a great game. Marqui Bunn led the Coyotes with 22pts and Deandre Terell led Dubois with 19. Game 6 - Rowan County Bulls knocked off the PrimeTime Players Showcase team in a game that the Showcase team led most of the way until the last 5 minutes of the game. Rowan was able to take the control of the game down the stretch with great defense and the ability to get easy baskets on the offensive end as they out scored PrimeTime Showcase 12-2 over the last 5 minutes in a 96-88 Rowan County Bulls win. Avery Patterson (6'2''-G-96, college: Alcorn St.) was the leading scorer for Rowan County with 27pts and Isiah Cureton added 28pts for PrimeTime Players Showcase. Game 7 - The Winston Truth formerly of the UBA took on the 3 time defending ECBL Champions PrimeTime Players in one of the featured matchups of the day. The Truth and PrimeTime Players traded baskets for the first 5 minutes before PrimeTime started to pull away and take a 54-33 halftime lead. The second half was more of the same as PrimeTime Players cruised to a 142-92 win, while hitting 28 three pointers total in the game. Game 8 - The Hickory Hoyas took on the Carolina Thunder in a match up of two of the leagues best teams in 2018. The Hoyas jumped out to a 14-0 lead and then a 17-1 lead before the Thunder started to hit some shots. The tempo of the game was fast paced with both teams running up and down the court, but the Hoyas still were up 50-47 going into halftime. The second half the Thunder couldn't miss a shot and the impact of sitting since 10am got the better of the Hoyas as the Thunder pulled away for a 111-98 win. Quincy Washington (6'5''-G, college: Allen) who last year was the league MVP with the Florence Wildcats led all scorers with 39pts for the Thunder and Justin Glover (6'3''-G, college: Winston Salem) led the host Hoyas with 23pts. 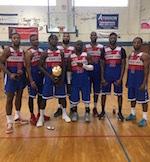 Game 9 - Petersburg Cavaliers where the last team to play there game and after a back and forth 1st half they pulled away in the second half for a 76-57 victory over the Carolina Showtime. Elijiah Moore and Dwayne Richardson led the scoring for the Cavaliers as they combined for 44pts and Darius Lee led the Carolina Showtime with 29pts. Game 10 - The Augusta Eagles met the NC Coyotes for the 1st time and where able to come away with a 100-92 overtime win. The game looked over with the Eagles up 90-85 with 30 seconds left in the game and with possession, but after missing FT the Coyotes where able to force OT after a Raymond McKeithan layup. The overtime period was all Eagles though as the gas tank was empty for the Coyotes and they were outscored 10-2 in overtime. The NC Coyotes were led in scoring by Raymond McKeithan with 27pts and Augusta was led by Daniel Quarles (6'8''-C/F) 23pts and Mike Couvson with 20 as both teams split wins and loses on the day. Game 11 - The final game of the day featured the Petersburg Cavaliers as the took on Rowan County.in a match up up of two Northern Conference ECBL foes. The Cavaliers were able to open up a 10 point halftime lead and both teams played even in the second half as Petersburg held on for a 79-70 win. Tommie Smalls who was part of Petersburg first season team and Elijah Moore combined for 34pts, while Rowan Countys Deshonte Carelock added 18.